The 4-port USB 3.0 hub lets you connect both USB-C and USB-A peripherals to your laptop or Chromebook, through a single USB Type-C or Thunderbolt 3 port. 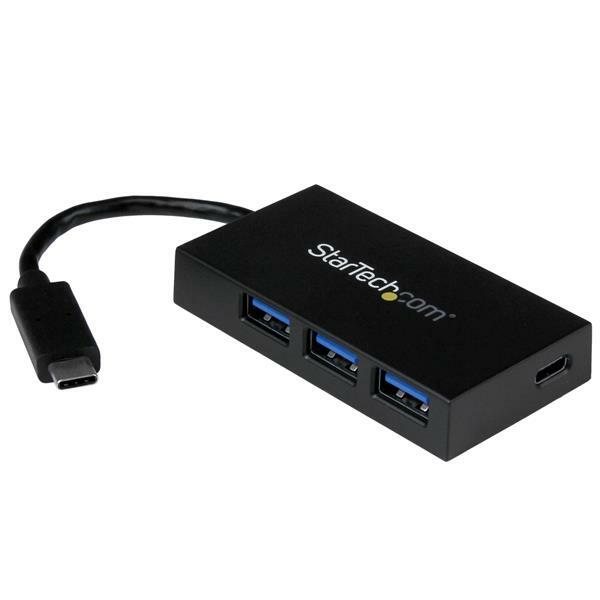 • This USB 3.1 Gen 1 hub lets you expand your USB connection options using the USB-C port on your computer. It offers one USB-C and three USB-A ports, letting you connect traditional USB devices now, while still being able to connect the growing number of USB Type-C devices in the future. • The integrated, easy-to-use USB Type-C connector is small and reversible, which makes for easier insertions. You can connect the plug with either side facing up, which means less risk of damaging your ports, and less frustration. • With a compact and lightweight design, the USB-powered hub is tailored for mobility. It easily tucks into your carrying case and expands your connectivity when traveling. • Plus, this versatile USB hub takes up minimal space on a desk, so you can use it in hot-desk or BYOD (Bring Your Own Device) environments. • Avoid the nuisance and cost of purchasing new peripherals by using this USB 3.0 hub with your current USB 3.0 and 2.0 devices. The bus-powered hub installs in seconds with no additional drivers or software required, and it’s compatible with virtually all operating systems. • Note: All ports support USB based video adapters including the USB-C port. This hub does not support DP Alt Mode (DisplayPort Alt Mode) - non-USB based native video support over the USB Type-C port.